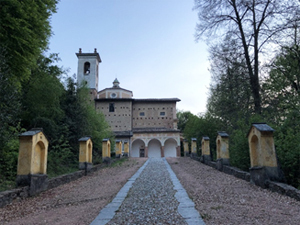 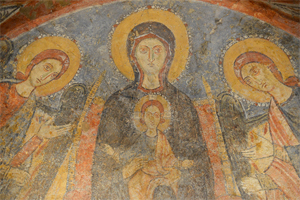 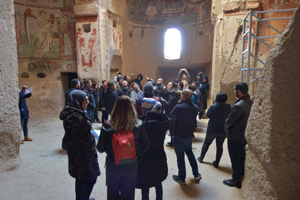 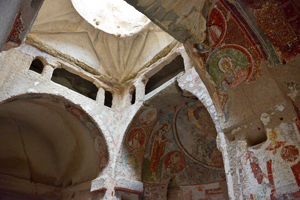 We observed Byzantine-style frescos painted on the stone walls inside Cripta di Quandedra and Chiesa rupestre di Sant’Antonio Abate in Massafra, as well as Cripta di Santa Maria Degli Angeli and Cripta dei Santi Stefani di Vaste in Poggiardo. 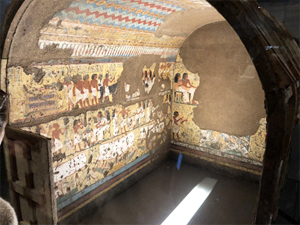 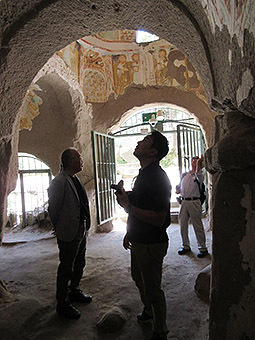 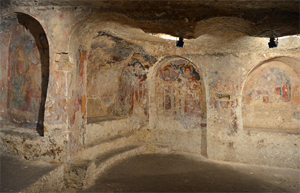 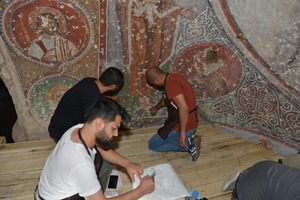 We conducted the investigation by paying attention to their fresco techniques and used materials, as well as their status and current conservation and management conditions with their surrounding environments taken into consideration. 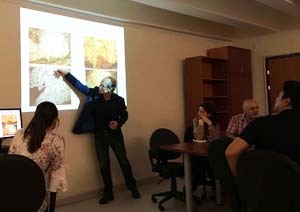 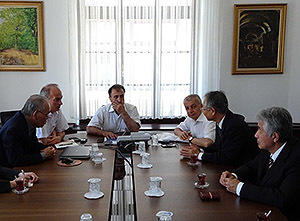 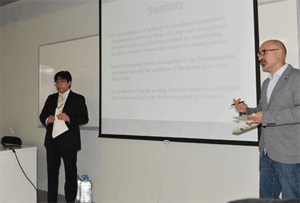 Consequently, we found that both Southern Italy and Cappadocia had common conservation and management issues, and that there were actions which had been taken in Italy but not in Turkey. 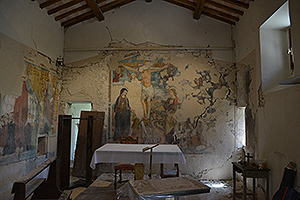 For this investigation, we asked the experts working for the Opificio delle Pietre Dure di Firenze, who have been cooperating in our training programs, to accompany us and organize the collected information. 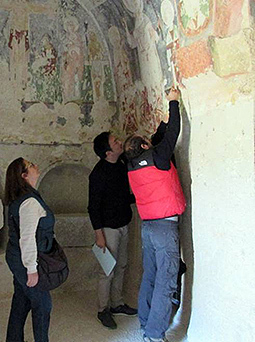 In the program planned in June 2019, we will tell the trainees under what circumstances the similar wall paintings are placed in Italy to seek better conservation and management approaches after reflecting these investigation results. 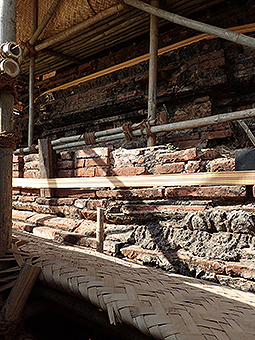 From July 18th to 29th, 2016, we carried out investigations of damage to outer walls of a brick-built temple as well as conducted review and experiments of restoration materials at the Mae-taw-yat temple (No. 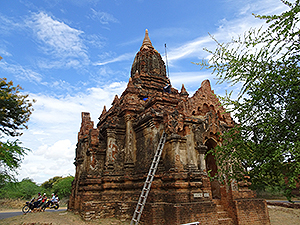 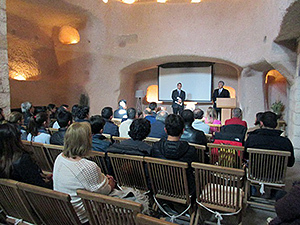 1205) within the Bagan Archaeological Zone. 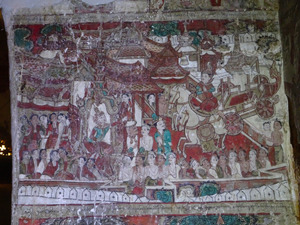 These investigations and experiments were implemented on the basis of the outcome of the survey that verified the state of conservation of the mural paintings on the internal walls of the temple, which had been completed in the previous fiscal year and revealed that the main cause of exfoliation and chipping of the plaster layer is leakage of rain. 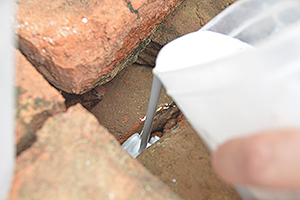 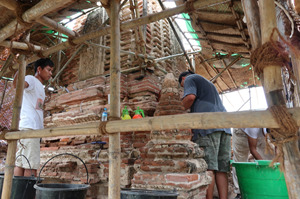 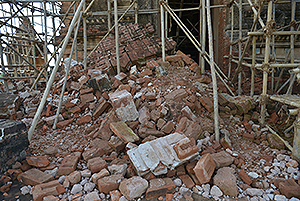 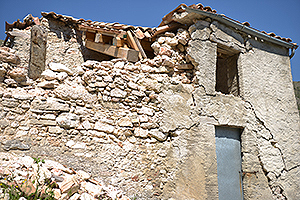 A European expert on brick material conservation and restoration participated in this on-site work. 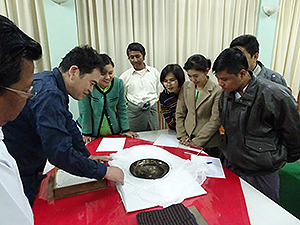 With staff members of the Myanmar Ministry of Religious and Cultural Affairs and the Bagan Branch of the Department of Archeology, National Museum and Library, we verified the characteristics of burnt bricks manufactured during the Pagan Dynasty from a wide variety of angles. 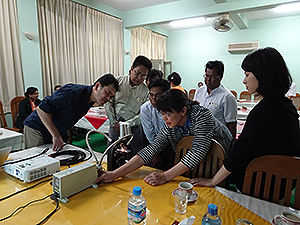 On the basis of the findings and considering Myanmar’s tropical rainforest climate, we selected materials suitable for restoration and conducted their tests as emergency measures for preventing leakage of rain. 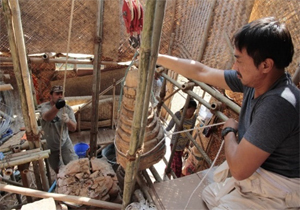 In consideration of the appearance at the archeological sites, we will continue to improve materials through monitoring the condition over time,. 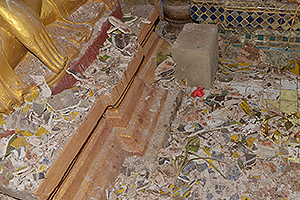 Furthermore, we performed multipoint measurements using a digital moisture meter to identify the distribution of moisture in the internal walls of the temple, and also took a video using a digital 4K camcorder to record the state of the external walls prior to the implementation of emergency measures. 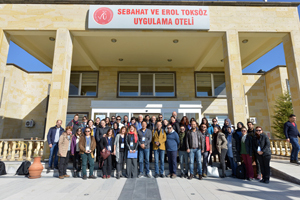 In this project, we aim not only to take temporary measures but also to establish a permanent method of addressing the problem. 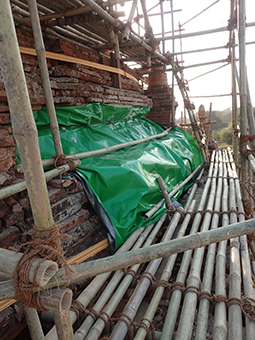 In anticipation of Bagan’s future, we will study reasonable ways that fit the current situation surrounding the protection of cultural properties in Myanmar and also work on capacity building of budding experts.